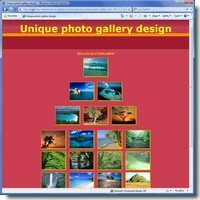 Galleries on this page were created with Easy Website Photo Gallery to show different templates and features of the program. 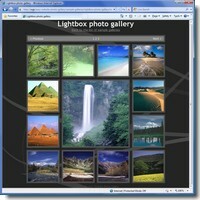 The software comes with more than 40 photo gallery templates. Each one of them can be easily modified to match your website design. This gallery has a slide show feature on full-size photo pages. Just click the Start slide show button and enjoy the photos! You can easily change the delay between photos in the program. Also you can manually navigate to next or previous photo. In this case the slide show is stopped, but you can resume it with a single mouse click. This gallery uses a modern Lightbox effect to show full-size photos. 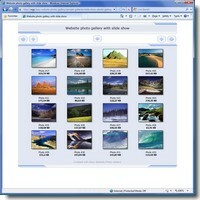 Plus, it shows the possibility to create photo galleries where thumbnails have different size. Also this gallery has different type of navigation: numbered links to all pages on every gallery page, not just links to the next and last page like in previous galleries. 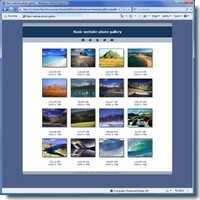 This kind of website photo gallery uses HTML frames to show thumbnails and full-size photos on the same page. You can click on any thumbnail to view corresponding full-size photo or use navigation buttons to go through all full-size photos in turns. Also this gallery shows total number of photos in the gallery as well the index of currently displayed photo using special tags. Your photo gallery can be really unique! 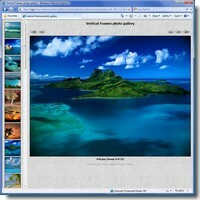 Easy Website Photo Gallery does not limit you to the design where all thumbnails must be in a table - you can place thumbnails anywhere on the page! Another feature shown in this gallery is a text added to all full-size photos in the gallery. And this text can also be shown or hidden on the thumbnails.